“My children cause me the most exquisite suffering of which I have any experience. It is the suffering of ambivalence: the murderous alternation between bitter resentment and raw-edged nerves, and blissful gratification and tenderness.” Adrienne Rich, Of Woman Born. Historically, motherhood has been viewed as a role rather than a relationship. It is a pre-scripted character that a woman is supposed to slip into, quietly abandoning her previous self for a self-sacrificing, silent and unconditionally loving figurehead. One of the most complicated and layered of human experiences reduced to an archetype, leaving little room for the flesh and blood mother to have authorship over any feelings that may stray from the ideal. I began the series The Second Moment shortly after giving birth to my first son. 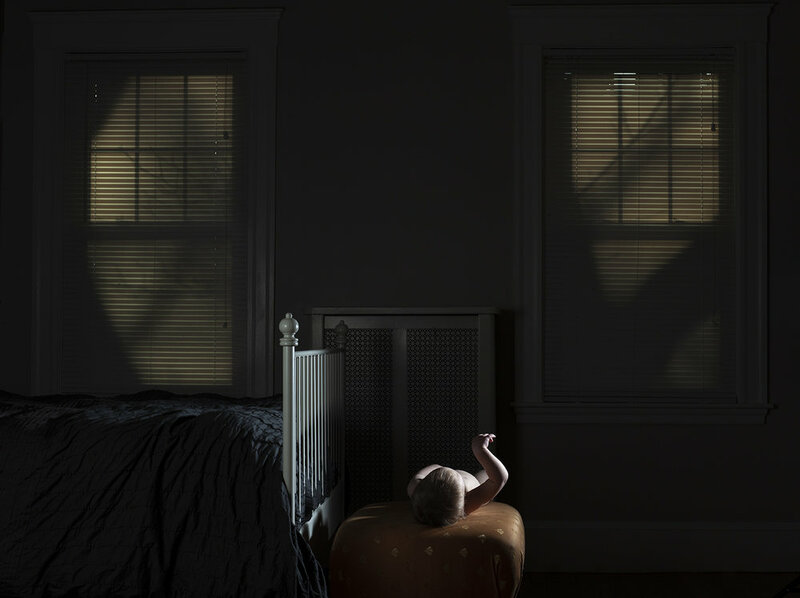 While the impetus for this work derives from my personal experience as a new mother, the images are also embroiled in the wider myth and fantasy of motherhood itself. Through a highly stylized and narrative approach, the subjects negotiate the shifting boundaries between mother and child.